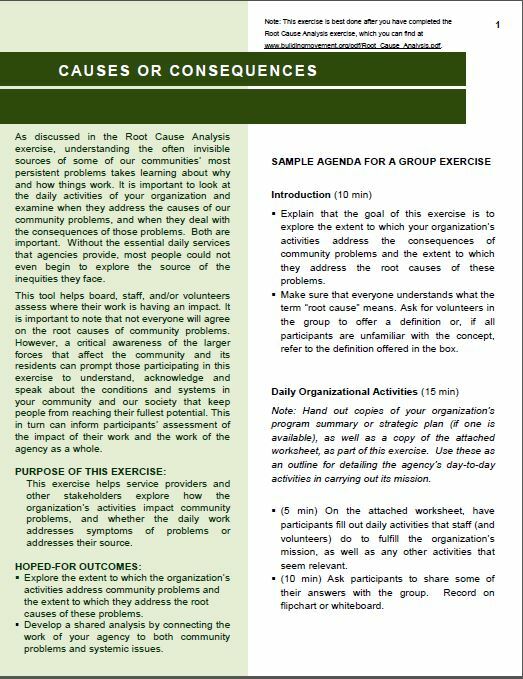 This exercise helps service providers and other stakeholders develop a shared understanding of the root causes facing your community. It can also help connect the work of your agency to individual and community problems, in addition to systemic issues. These two activities are used to conduct a root cause analysis and to explore the causes and consequences of issues that staff and constituents deal with on a daily basis. 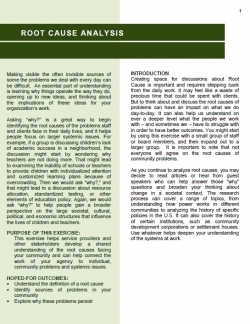 The root cause analysis includes a handout for the discussion about why conditions exist. The causes and consequences handout helps organizations explore the focus of the impact of their work. Are they addressing the (root) causes of conditions or the consequences, which doesnt lead to changing conditions and often creates the revolving door of service provision.